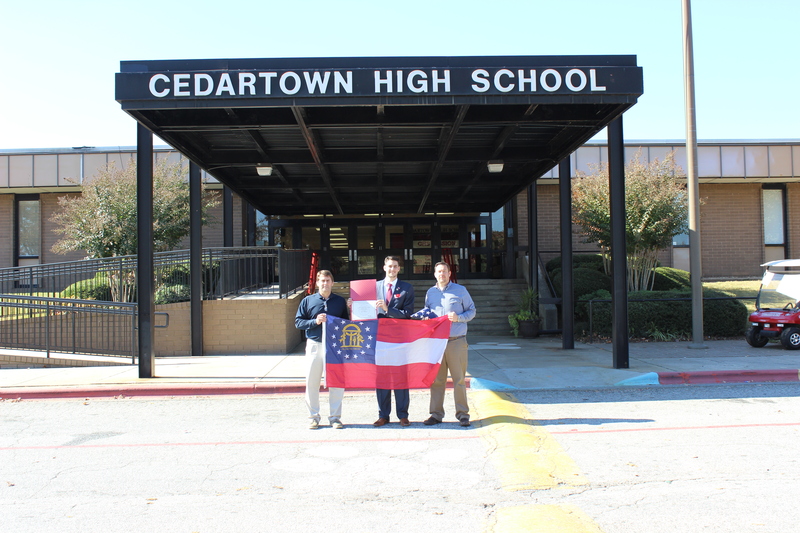 ATLANTA – State Representative Trey Kelley (R-Cedartown) recently presented Cedartown High School and its principal, Dr. Darrell Wetherington, with a commemorative United States flag and state flag of Georgia. The flags were presented on Tuesday, November 11, 2014. Commemorative flags of the United States and the state of Georgia are available through the Georgia Building Authority. These flags are presented in remembrance for veterans, family, friends, current members of the armed services, or to honor someone for a special accomplishment, service or retirement. Each one of these memorial flags has flown over the State Capitol and comes with a certificate of authenticity including the date on which it was flown. Representative Trey Kelley represents the citizens of District 16, which includes portions of Bartow, Haralson, and Polk counties. He was elected into the House of Representatives in 2012, and currently serves as the Secretary on the Higher Education Committee. He also serves on the Banks & Banking, Code Revision, and Judiciary committees.